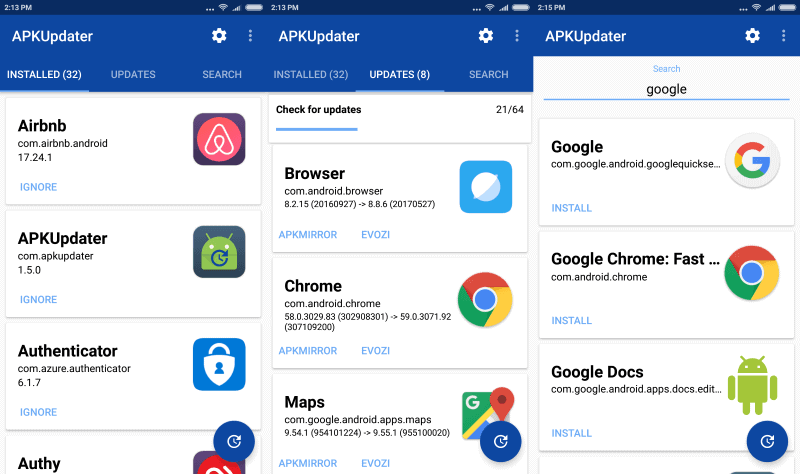 The latest version of the Android application update checker and installer APKUpdater, APKUpdater 1.5, brings support for Google Play update checking among other things. We reviewed APKUpdater when it was released to the public, and I suggest you check out the initial review for a general overview of the program's functionality. Basically, what it enables is an option to check for updates using alternate sources. While most Android users install apps from Google Play probably, some apps are not available on Google's main Android repository. This means that updates are not found automatically and/or installed, as Google Play has no information on those apps. APKUpdater uses third-party sources such as APK Mirror to check for updates, and provide options to install those with little effort. This is better, obviously, than having to monitor all apps installed on the device that came from non-Google Play sources. The new version APKUpdater 1.5 brings along with it three new features that all users of the program may make use of. Probably the most useful one from a user point of view is that APKUpdater may check for updates using Google Play. You get update information from Google Play even if you don't use the service. You may cross-check update information. Google Play is selected as one of the update sources automatically in the new version of the application. You can disable it under Settings if you want. There you may also enable other sources, namely APKPure and Uptodown, besudes APK Mirror. The second big feature addition lets you run searches on Google Play. You may download apps directly that are returned. Again, useful if you don't use Google Play, but prefer to download and install applications from the Play Store instead of third-party sources. The search was hit and miss on the Android version I tested it on. I'm not sure if this comes down to the device that I used, or if it is a universal bug that needs addressing. Finally, APKUpdater makes use of an official APKMirror API for its functionality. This improves the app significantly, both in terms of how fast the updater is now, and also reliability wise. APKUpdater 1.5 is a great update of the application that improves the app in several ways. It is faster now, more reliable, and integrates some Google Play store options as well in that version. Now You: Where do you download apps from? I only download apps from google play store. It’s nice if you have apps not from the store. There are plenty of sources and software to download Google Play store apps; I do wish there were also easy ways of downloading Amazon Appstore apps.